Yes, the tendrils of GDPR and the new data protection laws are far-reaching, affecting even tiny groups such as the village website and the horticultural society. But we are on the case! If you are happy to continue receiving email updates from the village website, then just have a read of the information below – no action required! Please note that you can unsubscribe from the mailing list at any time, by clicking the unsubscribe link at the end of the email or by contacting us. To run the village website we operate a latest news mailing list (using MailChimp) and deal with email enquiries sent via the contact form – so we are mostly dealing with your email addresses. We know what personal information we hold and why we hold it. We only hold and use what we data need to do the job (such as provide village news and announcements). We keep your personal information up to date (or you can easily update your mailing list subscription yourself). We keep your personal information secure and confidential. We will deal with a data breach within 72 hours, informing you and the Information Commissioners Office where necessary, i.e. in cases which might expose you to serious risk. We make it easy for you to withdraw your personal information (you can unsubscribe at any time from our mailing list). Our Website Privacy Notice is on the About/Privacy page if you want to read more. Garvald Horticultural Society collects membership data in order to run the annual village show. They have a separate Privacy Notice governing protection of this data. In summary, only personal data necessary to run the show is collected. This data is stored securely, not shared with third parties and only accessed by members of the Committee dealing with membership tasks. If you want to read more, the Garvald Horticultural Society’s Privacy Notice is available on the Garvald Horticultural Society page. If you have any questions, please use the contact form to get in touch. This entry was posted in Announcements, Garvald Horticultural Society, Website News on May 23, 2018 by Admin. Just to let you know that there are an increased number of posts being published on this website at the moment, to keep local people updated in these severe weather conditions. These posts will be sent out daily on the automatic email updates service, as usual. However, some information has also been emailed out as soon as it has been received, to get information to people at the earliest opportunity – so please bear with us if you find you are receiving emails with duplicate information. This entry was posted in Website News on March 2, 2018 by Admin. 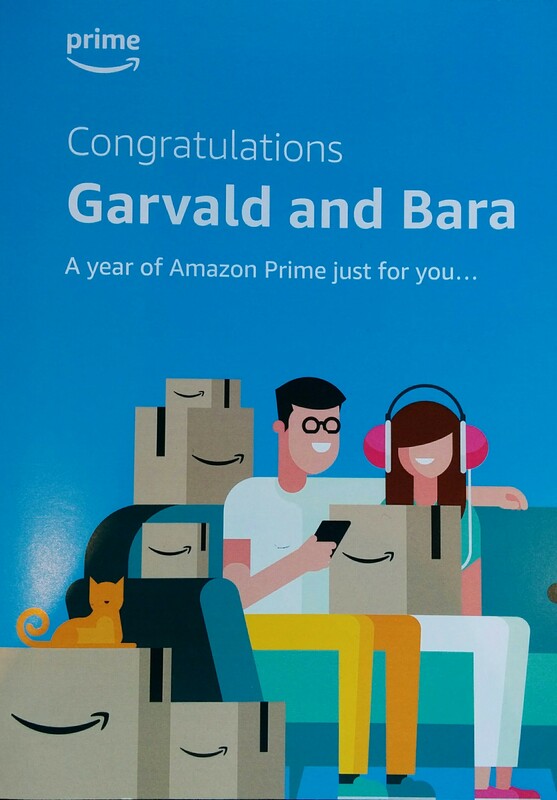 Residents of Garvald have recently been sent a leaflet in the post from Amazon, offering them a free year of Amazon Prime whether you are an existing subscriber or have never tried Amazon Prime before. Ten villages in the UK have been identified by Amazon as amongst the most frequent Amazon customers over the ten years since it launched its premium service. To celebrate 10 years of Prime, Amazon is giving away the freebie, worth £79, as a thank you to some of its most loyal customers. 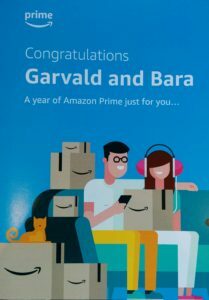 In Garvald’s rural location it make sense for us to buy online rather than making multiple visits to the shops, and if you use Amazon for online shopping, the offer is worth taking up. To access the free year’s subscription, use the unique code (which can only be used once) provided on the leaflet sent out to you by Amazon’s marketing department this week (shown above). If you do not wish to renew the service after your free year, please remember to cancel the subscription just before the year is up. When you sign up you can trigger an email to remind you about the renewal date. This entry was posted in Announcements, Website News on November 12, 2017 by Admin. Just to let you know that we will be switching to a new website hosting company in the near future. Please bear with us if there are any teething problems but hopefully it will all go smoothly and you won’t even notice. This entry was posted in Website News on October 9, 2017 by Admin. We provide a service where you can sign up and get the latest news from the Garvald and Morham village website, direct to your email inbox. Just click on the ‘Subscribe to our mailing list’ link on the right hand side of the website’s ‘Home‘ page and enter your email address to sign up. This entry was posted in Website News on March 9, 2017 by Admin. Tim Flinn has kindly lent us his selection of Ye Olde Garvald photos which have now been scanned and uploaded to the Gallery. As we don’t know who took these photos Tim has been credited as the source. Thanks, Tim! If anyone has any further historical village photos we can add them to the site as a work in progress. This entry was posted in Website News on December 20, 2013 by Admin. The Garvald Poetry Competition was organised to celebrate National Poetry Day, 3rd October 2013. After reading and re-reading over a hundred entries, judge Liz Lochhead has chosen her winners. Her comments are published along with the winning entries on the Poetry Competition 2013 page. In addition we have published a booklet online containing all entries for you to read and enjoy (downloadable in PDF format). We would like to express our thanks to Liz for being our judge; with so many entries it was a tremendous undertaking. We would also like to thank Garvald and Morham Community Council for providing funds for the book token prizes and Georgi Gill, Learning Manager at the Scottish Poetry Library in Edinburgh, for her support and for donating some lovely poetry books as prizes, on behalf of the Scottish Poetry Library. Congratulations to the winners. We hope you enjoy your prizes. And congratulations to all entrants for their fabulous range of poems of all different styles. We hope you have been inspired by this competition to continue your poetry-writing. This entry was posted in Website News on December 11, 2013 by Admin. Why not take a look at our History of Garvald page? We’ve had lots of interest and several comments from people researching their family trees and wanting information on village residents from the past. Also, if anyone has old photos of Garvald, we’d love to put them in our Gallery. If you can help with either of these requests, please get in touch using the Contact Us form. This entry was posted in Website News on November 14, 2013 by Admin. The website now has a page for useful community safety and winter readiness information, see Safety Information. This entry was posted in Community Council, Website News on November 13, 2013 by Admin. We’re delighted to announce that this year’s competition had 113 fabulous entries from local children at Yester Primary and Belhaven Hill School. What creativity we have in our midst! Poems have now been sent off for our judge, Liz Lochhead, to enjoy. This entry was posted in Competitions, Website News on October 28, 2013 by Admin.